Warm the 1 Tbsp. olive oil in a medium sauté pan over medium heat. Add the garlic and cook until fragrant, about 1 minute. Add the sun-dried tomatoes, kale, salt, pepper, and thyme. Cook until combined, about 2 more minutes. Transfer the mixture to a medium bowl. Add the parmesan and cream cheese. Stir to combine and set aside. 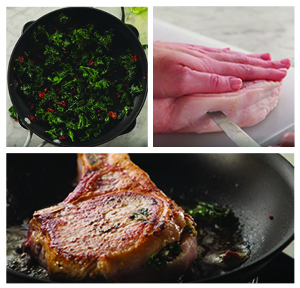 Use a sharp knife to cut a pocket into the thickest portion of the pork chop. Stuff each pocket with 1/4 of the kale and sun-dried tomato mixture and close the pork around the stuffing. Season the outside of the pork with salt and pepper. In a small bowl combine the chicken broth, lemon zest, lemon juice, and mustard. Warm the remaining 1 Tbsp. olive oil in a large, heavy skillet over medium-high heat. When the pan is hot add the pork. Cook until golden and cooked through, about 4 minutes per side, or until temperature reaches 145 degrees. Transfer the pork to a platter and tent with foil to keep warm.